With all of the conflict, confusion, and turmoil going on right now, the Ascended Masters and The Oversoul have offered up a beautiful concept for shifting The Earth Energies. We all get caught up in the collective consciousness, but what if we could make a difference? What if, instead, we place our energies into a positive, loving approach? Most everyone has heard of Dr. Masaru Emoto’s work and his book, “The Hidden Messages in Water.” He is the scientist who discovered that molecules of water are affected by our thoughts, feelings, and words. Since both humans, and the very Earth itself, are comprised mostly of water, doesn't it stand to reason that his message of Health, Global Environmental Renewal, and Peace can begin within each one of us? Like, if we symbolically placed our prayers into every body of water – the oceans, rivers, lakes, creeks, and waterfalls – wouldn’t they eventually reach the entire planet? Wouldn’t it begin to change the frequencies and energetically alter the Consciousness of All Humanity? And, if you add in the process of evaporation, wouldn’t our blessing-infused water touch all sentient beings? Plus, the rain forests, the deserts, the mountains, animals… everyone and everything? Find some rice paper, or other biodegradable paper, and write down the prayer that follows. (On the Equinox, people all over the world will be doing this.) Take this prayer and place it in any nearby body of water. You can get a group of people involved and make it very ceremonial, or, just do it by yourself. Because, even one person at a time has been known to change the World. Collectively, we can both change the World and alter its consciousness. Divine Source, Ascended Masters of Light, Angelic Beings, and all Holy Ones… We invoke your assistance as we pray for the healing of our planet, Mother Earth. We also pray that the Consciousness of Humanity will soon become more evolutionary… and change its thought process to one of Hope. Our intention this day is to infuse all the waters of our planet with engrams of Love, Unity, Healing, Peace, Oneness, Forgiveness, Honor, Compassion, Wisdom, and Truth. We beseech you to allow these infused waters to touch everyone and everything, so that our prayers, words, and intentions for a better world create peace and oneness in The Family of The Divine Presence. Amen. 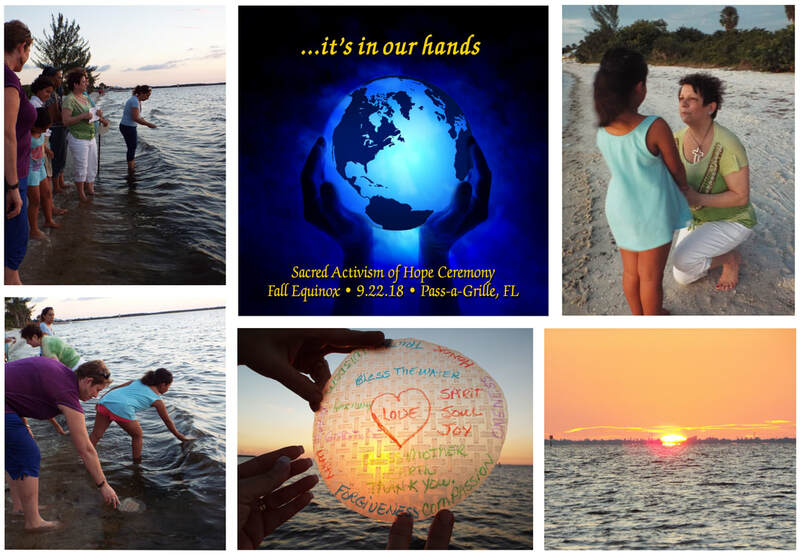 Those of you in Florida wishing to join us are invited to attend the Sundown Fall Equinox Service on the beach in Pass-a-Grille at 7:00 PM on Thursday, September 22, 2018. Exact location to follow. It's Been An Action-Packed Year Already! To say our Helen, Georgia May Event was magical wouldn't begin to describe it. It was more like being on the movie set of Avatar. Our nighttime trip up to the majestic Anna-Ruby Falls was incredible. Everything was illuminated by thousands of huge fireflies, bio-luminescent rocks, mountains, and enchanted glowing pathways. The Earth itself was vibrating, creating its own energetic vortex. The beautiful twin falls rushing down the mountain created yet another symphony of sounds and energy. We left that evening transfixed by one of Mother Nature's rarest moments. All of us can't wait to go back, because we were left with an indescribable feeling of longing. It was a moment of truth. Like we had somehow touched the face of All That Is. I feel blessed, invigorated, awakened and "on purpose." 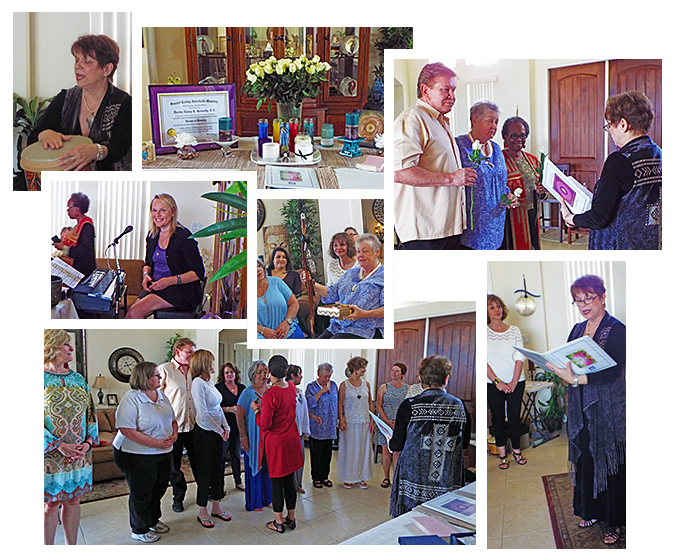 Our "Blueprint For Conscious Living" event was a huge success. Join us for our next one! Namasté, Rev. Dr. Sherry.